My changes to City Bakery’s cookie were to add salt, vanilla, toasted walnuts and some Vietnamese cinnamon I acquired as a gift. City Bakery also recommends chilling the dough. I chilled some of it, but I also baked a few cookies right away and they were very good. 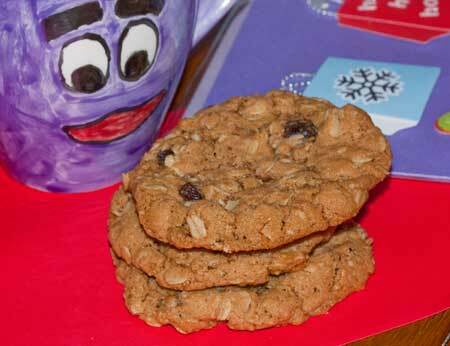 These cookies are big, sweet, fairly chewy and perfect for packing in tins or sacks. Santa will love them, just be sure to serve them with some protein-packed milk to keep his blood sugar stable. Thoroughly stir the flour, baking soda, salt and cinnamon together in a bowl. Add the oats and stir well. Set aside. In a large mixing bowl, beat the butter and both sugars until light and creamy. Add the vanilla and egg and beat just until mixed. Using lowest speed of mixer (or by hand), stir in the flour mixture, followed by the raisins and nuts. The batter will be very thick. Scoop up very generously rounded tablespoons (you’ll be using about 2 tablespoons total) of dough and shape into dense balls. Put the balls on a plate and chill until ready to use or bake immediately. Bake for 10-12 minutes at 350F. Let cool on baking sheets for about 2 minutes, then transfer to a wire rack. Mmm what a great cookie to leave Santa! I think I moght know a “Santa” or “Mrs. Claus” who would love these! They look delicious. Just made a few adjustments to the recipe. Noticed the amt. of sugar got cut off. Fixed. aren’t you good to think of Santa’s energy levels.